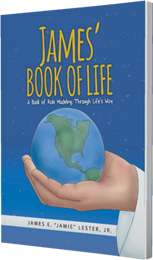 JAMES' BOOK OF LIFE by James E. "Jamie" Lester, Jr.
About the Book: James’ Book of Life follows James from boyhood to manhood. With each experience, he develops positive morals and values that stay with him for a lifetime. As the story is read aloud, parents will be reminded of the important role they play in their child’s spiritual development. Jesus’ presence in every illustration helps children to understand that Jesus is with us in every season of life. The Lamb’s Book of Life at the back of the book provides an opportunity to discuss its importance. Together, parent and child will develop a closer bond, strengthen their family, and help each other grow spiritually in God’s love. Although his interests are diverse, broadening his knowledge and caring for kids has always been important to author James E. “Jamie” Lester, Jr. This father, real estate broker, and appraiser holds a master’s degree from Liberty University, a bachelor’s degree from the University of Central Florida, and is purusing a doctorate from University of the Rockies. He is a former youth leader and has worked with children through the Florida Department of Children and Family Services and as a Family Court Mediator.